Decided to become a welder in Washington State? If your answer is yes, then this article is for you. Here, you can find the list of the best welding schools in the state as well as a bunch of useful tips and facts. If you want to become a welder, you should look for training programs to pursue your career. Completing your training, you’ll be able to enroll in the certification tests to prove your proficiency. In the list below, you’ll be able to find high-school welding programs, technical colleges, and centers. All of them were approved by the American Welding Society (AWS). 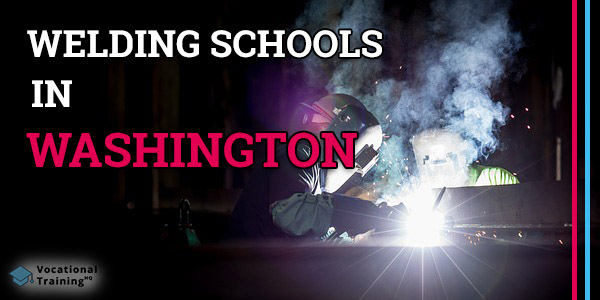 One of the most popular locations for welding training is Seattle. If you look for some options there, you should learn about Tulsa Welding School. It offers not only welding training programs but some other courses as well. In fact, Tusla isn’t a single option. There is a bunch of other welding certification schools in Washington State. Here is the table that contains contact info of all the certified welding schools in the state. Speaking of underwater welding schools, there is one in Washington State. It’s The Divers Institute of Technology which is one of the best welding schools in the state. It provides specialized training in marine diving technology. It’s clear that each person has its own reason for becoming a welder. However, there are multiple reasons that are common to everyone. First, welding is a rewarding career that can provide you with a stable income. Also, welding has an amazing outlook which grows constantly. The U.S. Bureau of Labor Statistics claims that the number of welding job offers will increase by 6% until 2026. To begin with, welding is a well-paid career. A median salary throughout the USA is about $39,390 per year or $21.90 per hour. At the same time, the top 10% of welders throughout the country earn about $62 100 annually. Speaking of welders in Washington State, their median salary is about $48 160 per year or $23.16 per hour while the top 10% of welders earn $66 020 annually. Before looking for welding training programs, it’s better to start with learning a little about welding itself. It will let you get a better understanding of this career and decide whether you want to be a welder. Also, it will make your further education easier. In simple words, welding is a process of joining metal pieces together. In order to do it, welders heat and melt metal. If you want to be a good welder, you should be strong physically and mentally. Also, you need to be attentive and detail oriented. One another point is that welders should be able to read instructions and blueprints. Welders choose methods and tools to perform their job based on project requirements. There are more than 100 welding methods. However, most of them aren’t frequently used. You should know that there are a number of similar career options but the most resembling ones are soldering and brazing. Both of these methods are used to join metal pieces as well as welding. But still, there are some differences. First of all, welding requires higher temperatures while soldering and brazing use temperature that is below 850 degrees Fahrenheit/450 degrees Celsius. One another point is that these methods require some extra materials such as so-called fillers. At the same time, brazing allows creating stronger constructions. As you see, there is a lot to learn if you want to become a welder. Nevertheless, if you choose a good training program, you’ll be able to get all the required skills and start your career. Use data in this article to get info about all the available welding training courses.